Sol Plaza Boutique Mall Annual Turkey giveaway! It’s that time of the year when we give thanks! Make this Holiday 🎉Season🎄 the best one ever! TURN UP at our Holiday event 2017 from Nov. 17- Dec. 16. Prestige Shape invites you to join its Breast Cancer event on Sunday, October 15, 2017, 12 pm- 2 pm at Sol Plaza Boutique Mall. Sol Plaza invites you to the GRAND OPENING of a new store ‘Prestige Shape’ on Aug 25th from 12 pm to 5 pm. Back by popular demand...Sol Plaza presents, "Bandas Y Mariscos"! What better way to beat the California Summer than to drink a chilled beer🍻 and enjoy some delicious Seafood by our authentic Mexican restaurant 'El Rincon' while you relax and enjoy some much-needed fun! Sol Plaza proudly presents an EXCLUSIVE Art Expose and Meet & Greet session with the artist Clarence “Pencilman” Pointer" plus Paint N Sip event. The BIGGEST party💃for the artists in the Antelope Valley is here! Hula hoopers, dancers💃, poets…any one who has some unique talent is invited to PARTY with us on Aug 6 from 5 pm- 11 pm at THE PATIO in SOL PLAZA BOUTIQUE MALL. It's almost time to go Back to the School! 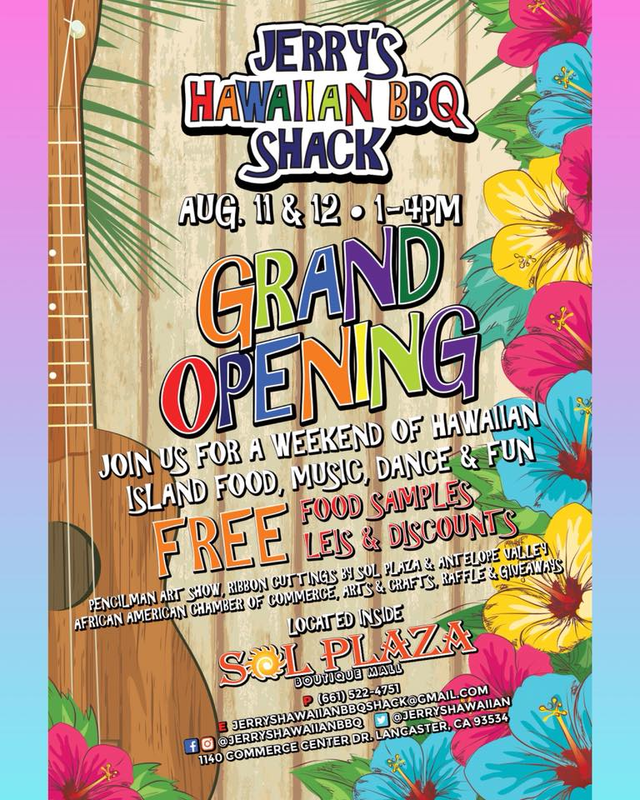 Sol Plaza invites you and your family for its Annual Back to School Backpack Giveaway event. We'll be giving away backpacks and school supplies! Get grooving with a musical night with "KARAOKE GAME NIGHT", only at Sol Plaza! Bring your friends and family to an entertaining evening of delicious food and drinks. Enjoy some delicious Seafood by restaurant 'El Rincon' while you relax and enjoy some much-needed fun! Enjoy delicacies from Sol Plaza's authentic Mexican restaurant El Rincon and few other concession food stands while you attend the discussion. 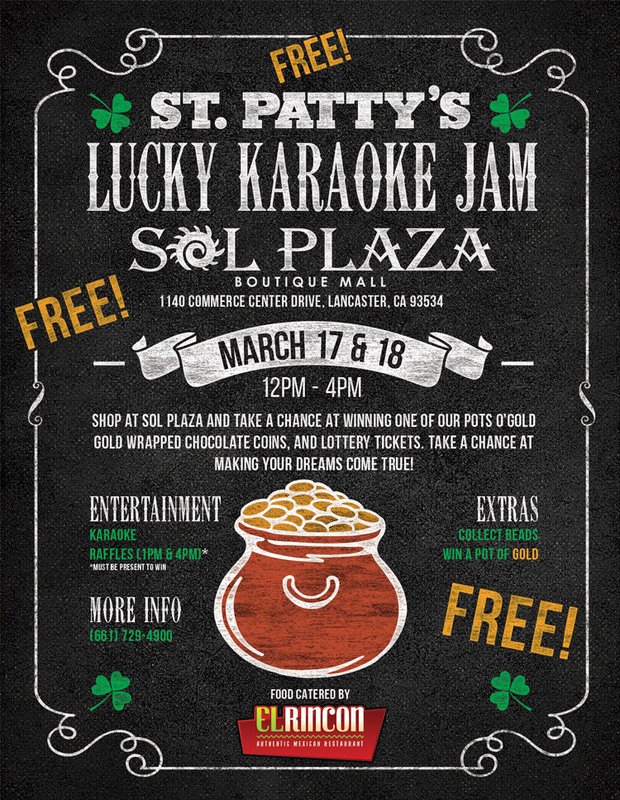 Don't miss out to have fun with your entire family at Sol Plaza's Family Day! Kids can enjoy on two bouncy Jumpers! There will be arts & crafts, Face painting & Piñatas to add more fun. An Outside bar, Live band & DJ will be there to entertain you! We will also be having raffles with numerous chances to win prizes to take home.